Addis have been a household name for as long as I can remember and they are the go-to brand for household items. They have recently launched a Made For Life range and I was asked if we’d like to take a look at a couple of items. We are mega fans of recycling as much as we can here and have a compost bin in the garden. Our bunnies enjoy vegetable and fruit scraps but anything else (previously edible) heads for the bin, via a (seen better days) container in the kitchen. 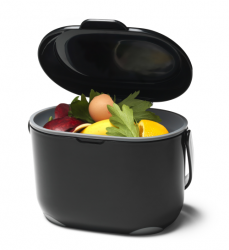 We were sent a couple of compost caddies to try (which meant the shabby container can be recycled, yippee) and are very pleased with them, the black or white alternatives complementing any kitchen decor. 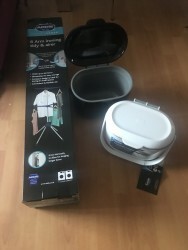 What I like about the caddy is its discreetness and that it has a lid, the cover can also be kept open if there’s a lot of food preparation being undertaken and that the inner bucket can be removed for washing. The carry handle is useful for our (as we call them) “Farmer Giles’ moments”, when carrying bits over to the compost bin. 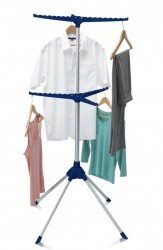 This will be used as more than an iron tidy here, I’m lucky that Hubbie doesn’t wear shirts for work, but both T and D have shirts for school uniform and it’s a handy accessory for them to be stored on hangers and kept neat. It’s also going to be very useful for use as an airer for, for example, hand-made jumpers and cardigans that need re-shaping after washing. When not in use, it dismantles for storage. Disclosure: we were sent these items to review, our words and opinions are our own.